Director: Byron Gregory Thompson, M.D. 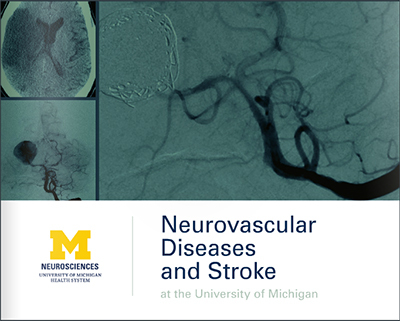 The Neurovascular Program of the University of Michigan evaluates and treats patients with vascular diseases of the brain, neck, and spinal cord. These include cerebral and carotid aneurysms, arteriovenous malformations of the brain and spinal cord, cavernous malformations of the central nervous system, and venous malformations. The program also provides state-of-the-art treatment to patients with cerebrovascular occlusive diseases including carotid stenosis, vertebrobasilar insufficiency, and other forms of cerebral vascular insufficiency. The program is one of a select few which offer both open surgical and endovascular treatment. Surgeons in the program have been nationally recognized for their expertise in endovascular and open surgical approaches to neurovascular disease. Complex patient cases are presented at a weekly Neurovascular Conference, where clinical issues and plans for treatment are reviewed by a panel of specialists in neurosurgery, interventional neuroradiology, and neurology. This multi-disciplinary approach assures that patients are treated through the optimal therapeutic approach.